As rental prices continue to climb due to fierce competition for rentals in this city, the scammers will start to circle. 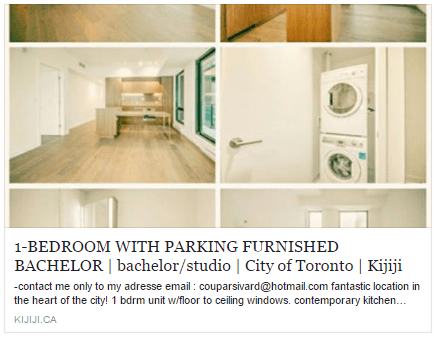 Recently I came across a post on Facebook for a bachelor condo at 96 St. Patrick St. that was renting for just $610/mth. 96 St. Patrick is a newer building right downtown close to University and Dundas and the most recent bachelor rental in the building on MLS was $1750 so immediately I knew something was wrong. The link has since been taken down but the pictures used for the listing actually showed a bedroom in one of the photos, so immediately I could tell this wasn’t adding up. I have taken note of your email. It is a Studio Bachelor 1Br close to all shops and amenities. The Studio is very clean as in the pictures it was occupied by my daughter. The rent is $ 610 expenses included (heating, hot water, electricity, high speed Internet access Wi-Fi, telephone, cable TV, 5 Electro, parking etc. . .). The reason for this potential rent is not to leave the Studio empty and not maintained since my daughter was in the Studio she had just joined me in Paris (FRANCE) for her studies for 5 Years. The Studio can be rented furnished or empty as you like. I also want to tell you that you have to give a guarantee of one month deposit (which is refundable at the end of the lease or taken into account for the last month’s rent). Regarding the visit, I will make an appointment with you to visit the Studio and eventually move on to the signing of the lease and the keys to the studio I am flexible in the lease, you can move when you want the next week or early in March – April . Please let me know if you’re still interested I’ll let you in the next message the list of documents required and a date for the appointment. CURRENT ADDRESS: Address of the Studio ( 96 St Patrick St , Toronto , ON , Canada ) and know that the Studio is available immediately. The tour can be done this week if you want. Understand How Scammers Work – Sometimes people will rent places on AirBnB to use for the scam so everything looks normal. 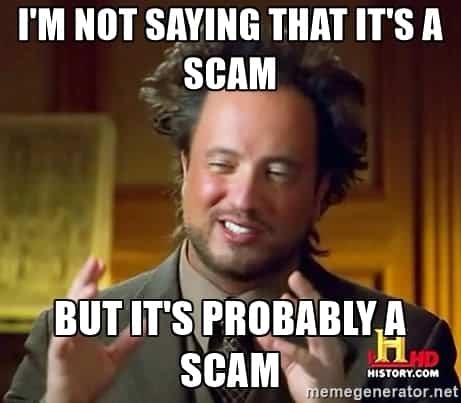 Other times they may just meet you at a condo and try to rob you once you arrive if you’ve told them you are bringing cash for a deposit. They will take you to a place which is seemingly theirs even though they may have no connection to the place whatsoever. Get Proof They Actually Own It – Don’t be afraid to ask the Landlord to see their ID and also a copy of the property tax bill to reflect that the name is the same. Call the building property manager and make sure everything lines up. The City of Toronto has computers where you can look up the owner of any property usually in the same office where you can get a marriage license. Never Give Cash – If the Landlord asks for cash, this is a huge red flag. Any payments to the landlord should be done via cheque. This at least gives a paper trail if something should go wrong. The maximum that a landlord can ask for in terms of a deposit is first and last month’s rent. Sometimes they may ask for a key deposit but this can only be the actual amount it would cost to replace the keys. Security Deposits are not allowed and if they have any issues just send them a link to the Residential Tenancies Act. Get A Third Party To Hold Any Deposits – As a Realtor when I rent a place, the deposit is always held by the brokerage listing the property until the tenant gets the keys. Lawyers also have trust accounts so if you aren’t using a Realtor try getting a lawyer to hold the deposit until the move in date. If you are ever skeptical and just want a second set of eyes, don’t hesitate to contact me. Go With Your Gut – If things don’t seem right and something seems too good to be true, it usually is. Trust your gut and if you feel that things seem kinda sketchy at any time, walk away. If you have any other tips, please share them in the comments below.